!Back to the Recipe now. 1. Soak the almonds for minimum of 6 hours to maximum of overnight . 2.Drain away the water.Wash the almonds. 3.Peel the almonds, if not using organic almonds. 5.Strain the mixture through the nut mylk bag. 6.The clear white liquid obtained is the mylk , while the almond meal left in the bag may be mixed in the flour to be kneaded for chapattis, etc. 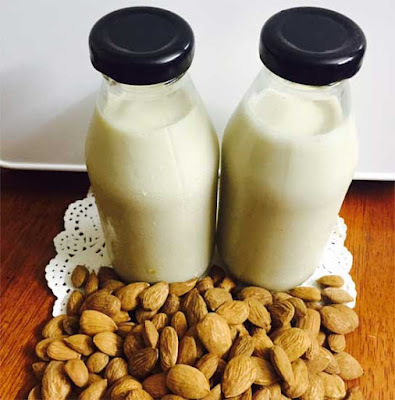 * While beginning on the journey of almond mylk, we recommend start with small quantities in one go, gradually increasing their size as per your own body’s calling .